Joti Rockwell and Nathan Church Hubbard sat next to each other in the first grade outside Washington, DC. They began writing and performing songs at age twelve. 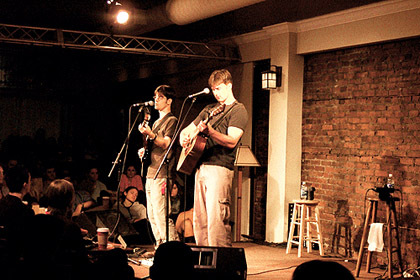 They released their first two full albums while still in college, teaming up with producers John Alagia (Dave Matthews Band, John Mayer) and Doug Derryberry (Bruce Hornsby, Earth to Andy). After college, they toured nationally and recorded more albums, sharing the stage with performers as diverse as Taj Mahal, Marc Cohn, Dar Williams, Francis Dunnery, and, in a particularly proud moment, Blue Oyster Cult. Currently, they continue to record and perform while Joti works on a doctorate in Music Theory at the University of Chicago and Nathan runs a number of music businesses in Charlottesville, VA. Antidote, Rockwell Church's fifth and most recent album, represents their most accomplished work to date, broaching new songwriting and arrangement frontiers for the duo while maintaining trademark Rockwell Church melodies, harmonies, and diverse instrumentation. Subject: [Etree] Rockwell Church - band would like to be added to the live music archive. always and still have an open trading/taping policy. may soon be a part of the live music archive.